F Patrick Baum (Swift Current, 1997-98) has retired, per Dresden (Germany, DEL2) website. This season, he had two goals and eight assists in 48 games. He played his entire 10-year professional career in DEL2. . . .
F Kevin King (Kootenay, 2006-11) has signed a one-year contract with the Milton Keynes Lightning (England, Premier). This season, he hd 16 goals and 15 assists in 44 games with Gap (France, Ligue Magnus). He was an alternate captain on the team that won the French championship. . . .
F Lukáš Zeliska (Prince Albert, 2006-07) has signed a one-year contract with Dunkerque (France, Division 1). This season, with Cholet (France, Division 1), he had nine goals and eight assists in 24 games. 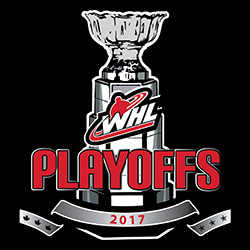 In this space yesterday, with the help of Hartley Miller of 94.3 The Goat in Prince George, we pointed out that home teams went 44-41 in the WHL’s 2017 playoffs. Having read that, Dean (Scooter) Vrooman, who has been around the WHL almost as long as ice, sent along a note. Scooter is the go-to guy when it comes to chronicling winners and losers in series that have gone seven (or nine) games. This time he passed along some numbers that involve series that have gone the distance over the years. From 2012 through 2017, the road team was 4-11 in Game 7s. Road teams were 2-2 in Game 7s in 2017. From 2004 through 2010, the road team was 10-10 in Game 7s. From 1986 through 2003, the road team was 3-29 in Game 7s (or Game 9s). 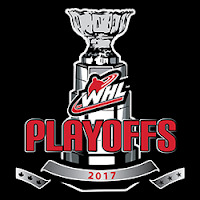 From the beginning of the WHL in 1966-67 through 1984, the road team was 5-10 in Game 7s or Game 9s. Overall numbers are: In 82 deciding games in series that went the distance (seven or nine games) in league history, the home team is 60-22. And with Lethbridge and Regina each coming from 3-1 down to win a playoff series this year, there is this interesting factoid: Teams have rallied 11 times since 1996 from 3-1 down to win a best-of-seven playoff series. In 2017, two teams rallied from 3-1 down in the same playoff year to win a series for the first time since 1998. The Kootenay Ice has signed F Connor McClennon, who was the second overall selection in the 2017 WHL bantam draft. McClennon, from Wainwright, Alta., will turn 15 on June 25. He played this season for the bantam prep team at the Pursuit of Excellence in Kelowna, putting up 99 points, including 45 goals, in 30 games. . . . McClennon is the first player signed under the Ice’s new ownership team of Greg Fettes and Matt Cockell. Will former Moose Jaw Warriors F Kelly Buchberger sign on with the New York Islanders as an assistant coach with good friend Doug Weight, who is the head coach? Elliotte Friedman, in his latest 30 Thoughts, reports that Buchberger and Weight spent some time watching the WHL championship series, specifically F Mathew Barzal of the Seattle Thunderbirds. . . . That piece is right here. The Victoria HarbourCats of baseball’s West Coast League have signed Claire Eccles, a left-handed pitcher, as the league’s first female player. Eccles, 19, is from Surrey, B.C., and has played for the Canadian women’s national baseball team. Eccles was introduced at a news conference in Victoria on Tuesday. . . . Jim Swanson, the HarbourCats’ managing partner, is a former sports editor of the Prince George Citizen who covered the Cougars for a number of years. . . . There is a news release right here. The NHL’s New York Rangers have fired Ken Gernander, the head coach of their AHL affiliate, the Hartford Wolf Pack. Gernander, 47, had been the coach in Hartford for 10 seasons. Including his time as a player, he had been there since 1997. The Wolf Pack was 388-304-84 with Gernander as head coach and made the playoffs in five of 10 seasons. However, it missed the playoffs the last two seasons and four of five. . . . At the same time, the Rangers named Chris Drury has Hartford’s general manager. Jim Schoenfeld, who had been the GM, is the Rangers’ senior vice-president and assistant GM and will focus on working with the NHL club. Ray Bennett and Rick Wilson, both of whom have ties to the WHL, were among four assistant coaches fired by the NHL’s St. Louis Blues on Tuesday. . . . Bennett, 54, had been on the Blues’ staff for 10 seasons, after spending seven with the Los Angeles Kings. A native of Innisfail, Alta., Bennett worked with the Spokane Chiefs and Moose Jaw Warriors before heading to L.A. . . . Wilson, a Prince Albert native who spent one season with the Blues, has been an NHL coach for 28 years. Before joining the New York Islanders, Wilson, 66, was a coach with the Prince Albert Raiders for eight seasons (1980-88), the last two as head coach. . . . The Blues also dropped assistants Ty Conklin and Steve Thomas. Adam Keefe, 33, is the new head coach of the Belfast Giants. He spent the previous two seasons with the Giants as a playing assistant coach. Keefe, the team captain from 2012-17, has been with the organization since 2011, helping the Giants win two Elite League championships. . . . Keefe replaces Derrick Walser, whose contract wasn’t extended after this season ended.